Vitamins play an important role in the body of shrimp which help in performing different body function and helps in maintaining better health. 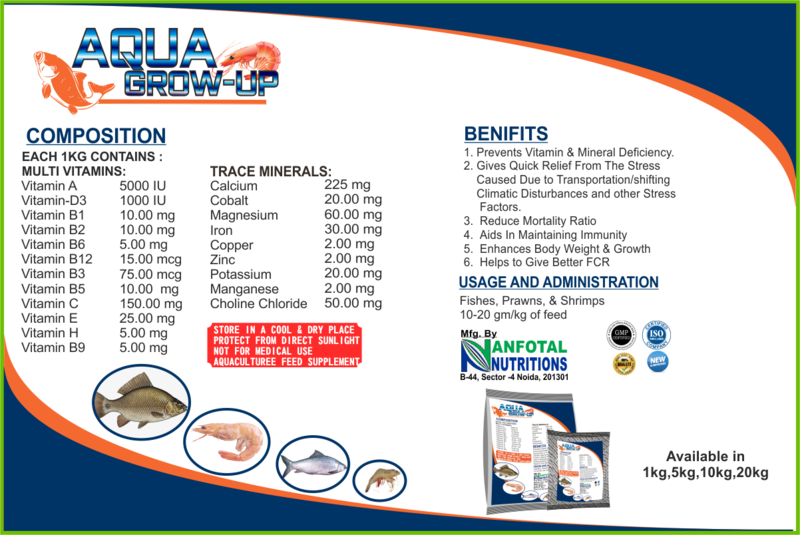 Vitamins are a heterogeneous group of organic compounds that are essential for better growth and maintenance of shrimp and other aquatic life. The requirement of vitamins is gained by the feed which helps in providing vitamins with other vital nutrients. Availability of these nutrients in the body provides many benefits to the body. Maintains healthy skin and membrane. Promotes better working of the immune system. Decrease the risk of diseases. Regulates moult phase in shrimp and prawns. Any kind of deficiency in the body gives rise to different health problems. The deficiency occurs when the aquatic feed is unable to provide the desired nutritional value to the body. To recover from this there is a need for an aqua multivitamin supplement which helps in removing the vitamin deficiency. We can use “Aquagrow Up” as shrimp vitamin supplement which aids in this. It is composed of vital vitamins with shrimp trace minerals shrimp trace minerals that act faster and provide desired health. 1. Helps in preventing vitamin and mineral inadequacy. 2. Provide quick relief from stress. 4. Build stronger immunity . 5. Enhance body weight and growth. 6. Helps in giving better feed conversion ratio.